Batman’s fateful rival and love interest, Catwoman is making her return to the BISHOUJO series with brand new art by Shunya Yamashita! Catwoman rests against a burlap sack stuffed with cash, with a satisfied smile on her face that is sure to steal your heart! 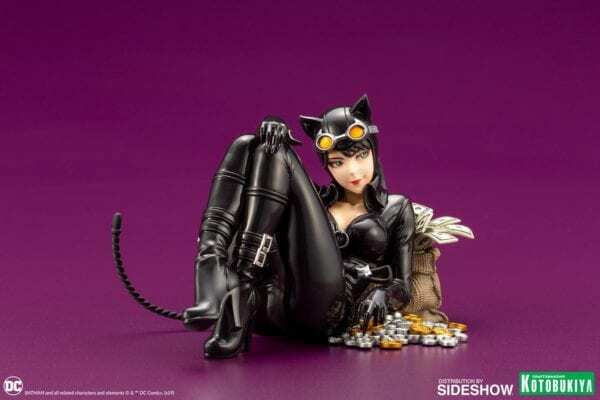 The Catwoman Returns statue is packed with exciting details that give the piece a unique sense of atmosphere, from Catwoman’s signature whip that playfully resembles a cat’s tail, to the actual kitten’s tail peeking out from Catwoman’s stash. The detail in the statue’s sculpting as well as the variety of texture and paint give this BISHOUJO a unique appearance that is sure to win its way into your heart and your collection!